The city of Mumbai itself. We had wandered around this blend of rich textures and smells, that passes for a modern enlightened city, for two days now and I still found it hard to get a handle on. Millions live here of all financial levels, seemingly divided by success and yet managing to live together. To some this is a dangerous cocktail that after a few days has you tearing your hair out, but I’m from another city alike this one; London; and I know how to stop a city from getting to you. The film features scenes of the harshest looking kinds; shanty towns, rubbish dumps, concrete jungles, disgusting garbage and kids begging on the streets. It is a testament to the film’s quality and reality that the young beggars all look exactly like the little fellow that was yanking on my arm only a few hours earlier, asking for a dollar. Not since Children of God, the film that told the story of Rio, has a film so nailed the sense of a city. 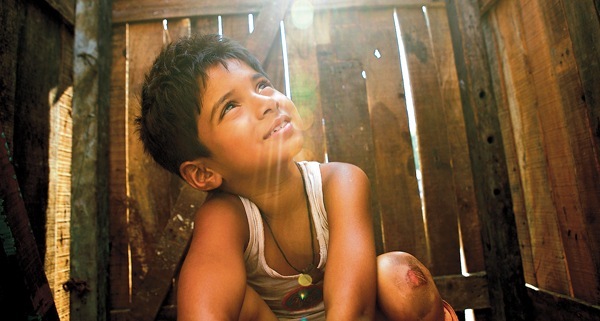 For while Slumdog Millionaire is a fictional story, it has a real smell of truth about it. Make no bones, this is a movie that isn’t afraid to make your stomach turn and your heart break. The story is simple enough; a young man is doing very well on the Indian version of “Who wants to be a millionaire?” The police however know that he is a simple boy from the rough part of town; a slumdog; and shouldn’t be able to answer such hard questions correctly. They arrest him for cheating and, after torturing him mercilessly, take him through his questions as he explains how his past enabled him to simply know the answers. Of course there is a girl involved. I did say that the story was simple. There is even a dance number at the end, over the credits. Slumdog Millionaire showed me more of the soul of Mumbai than I had gleaned in my two days visiting the city as a tourist. It showed me the underbelly; the necessity of crime to survive in a place that can be so grim and yet, somehow, so beautiful. In the end the story is perfect for Mumbai, the home of Bollywood, in that it is a romantic love story and thankfully a really good one. We both loved the film immensely, the acting is uniformly great and the romance believable and so recommend it whole heartedly. 8.